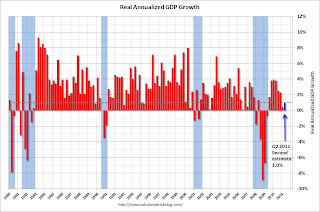 The good news is that if Q2 GDP would have been revised downward as much as Q1 was in the annual revision earlier this month then we would have been in negative territory. This is actually pretty good news for the Administration that believes there will not be a double-dip recession. It gives everyone hope that a double-dip can be avoided.